In the age of intellectual economy, science and technology have tuned in our daily life. Intellectual economy is now synced with the latest science and technology innovation, which suggests a new economy growth mode of intellectual operation. Science-tech-led enterprises begin to sport more vitality in economy activities and determine the future trend of economy development. When it comes to transporters, the latest innovation is electric unicycle. Airwheel electric unicycle stages as the latest hi-tech intelligent product featuring zero-emission and high performance. Developed based on aviation attitude control and fuzzy software algorithm, Airwheel electric unicycles, AKA self-balancing unicycle delivers better and portable user experience with affordable cost. The power consumption is only 1KWh/100km, which makes it the optimal transporter for short commute trip as well as a fun entertaining equipment. 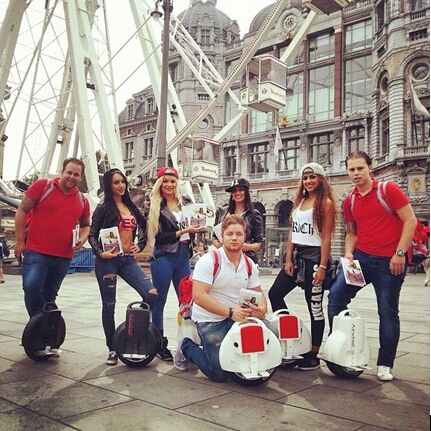 As a leading brand name in the industry, Airwheel has taken the global market at a phenomenal speed. Powered by original Sony lithium battery and controlled by intelligent balance chip, Airwheel has been granted with multiple international certifications and protected with quadruple safety measures. Airwheel facilitates people’s daily life as a handy transporter and highlights people’s leisure time as a fresh workout gadget. Truly that everyone opts for their own workout mode and routine, yet with Airwheel combining workout with fun, portability and fashion, it is an ideal option for everyone. Airwheel electric unicycle stages as the best received workout gadget, which improves riders’ balancing skills significantly and builds strong abs. However, there’re at least a dozen electric unicycle manufacturers out there on the market, who are mostly off-grade assemblers with little awareness of safety and quality. Consequently small incidents like battery explosions, sudden power cutting-offs have caused some injuries. So for safety concerns, better choose branded products with high quality. Airwheel is designed for everyone on various occasions. It facilitates your daily commutes to the subway, bus stop or pedestrian lane and wins you 200% rate of second glance. For freshmen, it will be the best partner to get around the campus, e.g. commute between the teaching building, dormitory and playgrounds. In addition, a weekend get-away into the country can be green, pleasant and free on Airwheel. Enjoy your life enlighten by Airwheel!